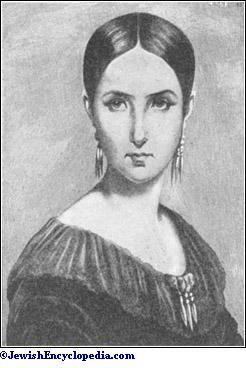 French actress; born in the Soleil d'Or, the principal inn of the village of Munf, in the canton Aargau, Switzerland, March 24, 1821; died at Cannet, near Toulon, France, Jan. 3, 1858. Her father was of German extraction, and lived by pedling at Lyons, and afterward at Paris. In the latter city his daughters sang on the streets for a living, and it was there that Rachel was overheard by Etienne Choron, who gave her free instruction, and afterward took her to Pagnon Saint Aulaire, a dramatic teacher, who taught her declamation. Rachel obtained an engagement at the Comédie Française at a salary of 800 francs, but for some unexplained reason the contract was cancelled, and the actress went back to her studies, this time at the Conservatoire. Her début took place at the Gymnase (1837), where she appeared in Paul Dupont's "La Vendéenne"; but, achieving only moderate success, she continued her studies for another year, at the end of which she joined the company playing at the Comédie Française, taking the part of Camille in "Les Horaces" (June, 1838). Here Rachel created an extraordinary sensation. She acted in "Cinna," "Andromaque," and "Mithridate," taking the part of Monime in the last-named play. Rachel made Racine and Corneille's works pay better than modern plays, and saved the Comédie Française from financial ruin. But her father now put forward enormous claims upon the managers, demanding what was then the unparalleled sum of 20,000 francs a year. This aroused the ill will of several critics and of others connected with the Comédie Française. 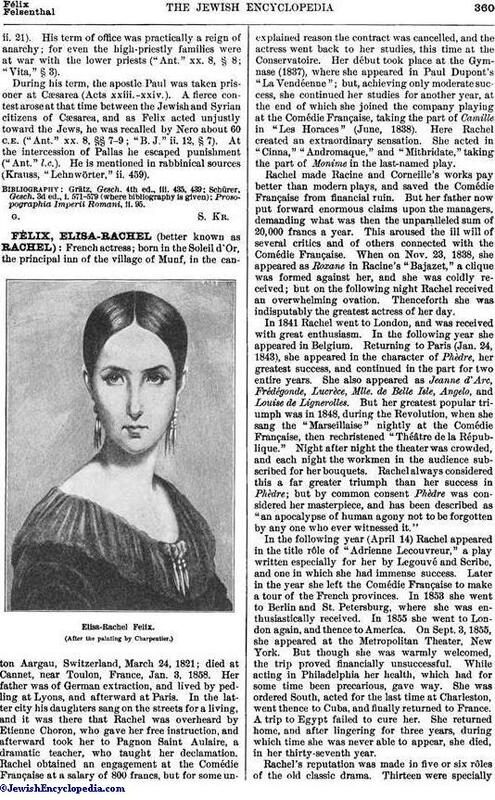 When on Nov. 23, 1838, she appeared as Roxane in Racine's "Bajazet," a clique was formed against her, and she was coldly received; but on the following night Rachel received an overwhelming ovation. Thenceforth she was indisputably the greatest actress of her day. 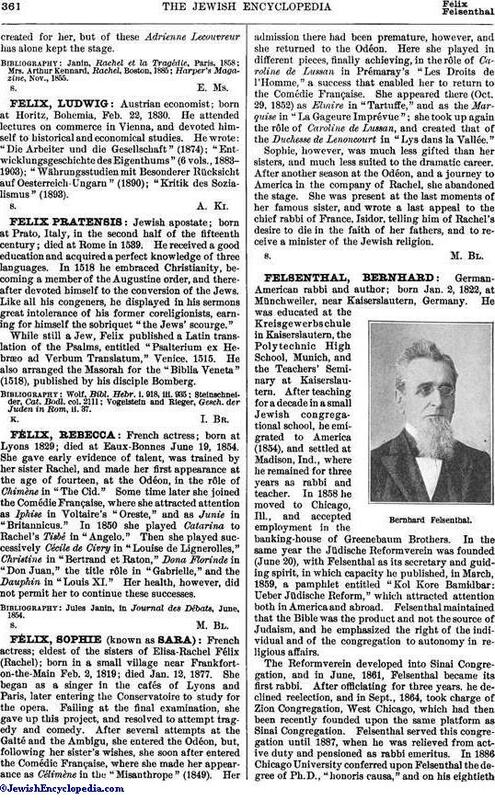 In 1841 Rachel went to London, and was received with great enthusiasm. In the following year she appeared in Belgium. Returning to Paris (Jan. 24, 1843), she appeared in the character of Phèdre, her greatest success, and continued in the part for two entire years. She also appeared as Jeanne d' Arc, Frédégonde, Lucrèce, Mlle. de Belle Isle, Angelo, and Louise de Lignerolles. But her greatest popular triumph was in 1848, during the Revolution, when she sang the "Marseillaise" nightly at the Comédie Française, then rechristened "Théâtre de la République." Night after night the theater was crowded, and each night the workmen in the audience subscribed for her bouquets. Rachel always considered this a far greater triumph than her success in Phèdre; but by common consent Phèdre was considered her masterpiece, and has been described as "an apocalypse of human agony not to be forgotten by any one who ever witnessed it." In the following year (April 14) Rachel appeared in the title rôle of "Adrienne Lecouvreur," a play written especially for her by Legouvé and Scribe, and one in which she had immense success. Later in the year she left the Comédie Française to make a tour of the French provinces. In 1853 she went to Berlin and St. Petersburg, where she was enthusiastically received. In 1855 she went to London again, and thence to America. On Sept. 3, 1855, she appeared at the Metropolitan Theater, New York. But though she was warmly welcomed, the trip proved financially unsuccessful. While acting in Philadelphia her health, which had for some time been precarious, gave way. She was ordered South, acted for the last time at Charleston, went thence to Cuba, and finally returned to France. A trip to Egypt failed to cure her. She returned home, and after lingering for three years, during which time she was never able to appear, she died, in her thirty-seventh year. Rachel's reputation was made in five or six rôles of the old classic drama. Thirteen were speciallycreated for her, but of these Adrienne Lecouvreur has alone kept the stage.